Fine dining with three talented chefs. Charming Christmas songs are playing in the background, snow is falling softly outside, and the tree is sparkling. It’s the perfect Christmas setting. The only thing missing? A fantastic meal! With this sophisticated menu, you’ll delight your guests—and yourself—this season. We’ve travelled far and wide through Germany to find three of the best S.Pellegrino Young Chefs to create a special Christmas menu for Kitchen Stories. Chef Denis Brühl kicks the menu off with a refined fish appetizer. The arctic char provides the perfect base for the combination of delicate spices that accompany it. Denis cooks at the famed Michellin starred restaurant of the Hotel Kronenschlösschens in Eltville on the Rhine. 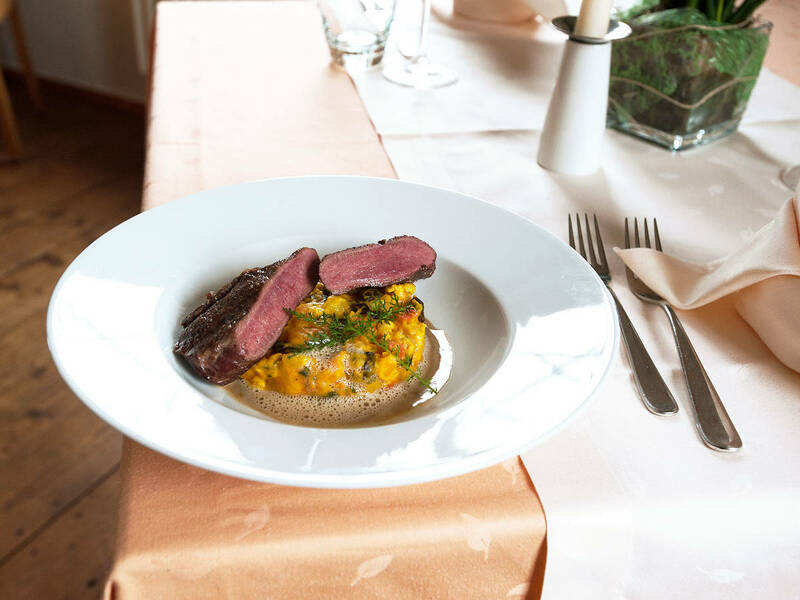 The main course is the work of Markus Ihle: A tender roasted saddle of venison laced with ginger and herbs is rounded off with a rich potato and pumpkin sugo. The juniper berry foam pulls all of the dish’s elements together and gives the creation a surprising lightness. Marcus cooks in Restaurant Richter in Chemnitz. Falko Weiß rounds off the meal with a fantastic dessert of warm speculaas cake served with a plum compote. The cake is easy to prepare and is adaptable to various spices that can be exchanged depending on the season and flavor you want to achieve—there are no restrictions here! Falko cooks at the Restaurant A la Minute in Trier. How did we come to choose these three talented young chefs? They all made it to the top 10 of the Austro-German preliminary round of the S.Pellegrino Young Chef 2016 Awards. Out of these ten chefs one then moved on to represent the region in the international competition. This year the trophy was awarded to Mitch Lienhard from the United States. One of S.Pellegrino’s missions is for sparkling Italian mineral water to become a staple beverage served during fine dining alongside high-quality wines. Thanks to the S.Pellegrino Young Chef Award, S.Pellegrino is able to support talented chefs worldwide and help them get on their way to their own culinary success stories. As the competition went on, it became clear that these three talented young chefs were highly enthusiastic and had benefitted from being able to learn from, and exchange ideas with, one another. Their enthusiasm and passion shines through in their sophisticated recipes, but you’ll be able to make these dishes yourself at home thanks to our videos and step-by-step recipes! Start cooking—and enjoy!